Often the biggest frustration for those with combination skin is caring for it properly. Having both dry and oily skin areas on your face can make skin care seem almost impossible. 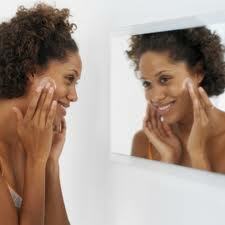 There are, however, things that you can do to care for and keep your combination skin healthy and feeling good. For one thing, some areas of your face may feel tight after you wash. This will typically be on the parts of your face not included in the T-zone area. These areas will likely also look flaky and dull and may feel rough. First of all, make sure you are cleansing every day. Use a mild cleanser on your entire face. Use the cleanser twice a day, preferably before bed at night and after getting up in the morning. These are the times your face most needs to be cleansed anyway, but if you have combination skin it is imperative. Get a good moisturiser. Once you have identified which parts of your face are the dry parts, most likely these areas are not in the T-zone and this is the area you will treat. Use the moisturiser on those dry areas only. Using it in your oily T-zone will only make that area worse. The goal when you have combination skin is to normalise it. Normalising is trying to gain a balance between the oily and dry areas so that all your skin looks and feels the same. In order to accomplish this feat, you want to look for products that are made for such normalisation. For instance, ones that contain alpha hydroxyl acids (fruit acids or AHA’s) or retinols will work best. Retinols are a vitamin A derivative. Such products should help you to gain more normal and even looking skin. The reason AHA creams are so beneficial to your skin is that they are a catalyst for skin cell regeneration. By burning off or removing the top layer of skin cells (or the too oily and too dry ones) they expose the healthier skin cells beneath them. These cells are more likely to absorb moisturisers. They also help improve skin elasticity through their water-binding properties. This can help with that “tight” feeling you may get in the dry areas with your combination skin. The only thing about which you need to be aware is that once you are using AHA’s, you need to continue using them. Once you stop, your cells will not regenerate at the rate they were with the AHA and will return to their original state very soon.